The east view is shown here with faults. All images are available with or without faults. View medium quality 170K JPEG image in your web browser: without faults, with faults. 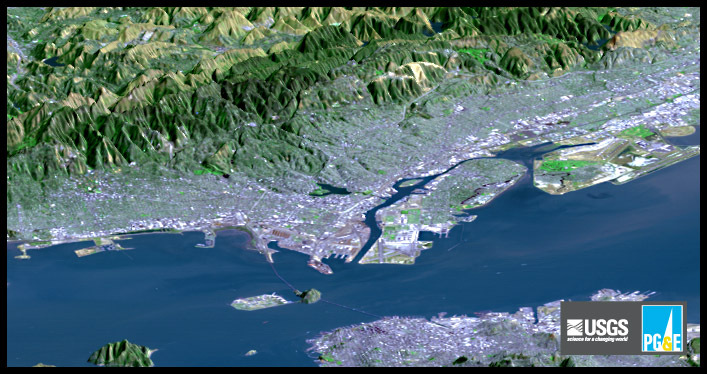 View a close up (~160K JPEG) of the East Bay with faults, Oakland/Berkeley area without faults, Oakland/Berkeley area with faults. Download* a US Letter sized high quality JPEG (600K)for printing at home: without faults, with faults. Download* a close up (300K) of East Bay with faults, Oakland/Berkeley area without faults, Oakland/Berkeley area with faults. Download a close up of the the East Bay with faults.